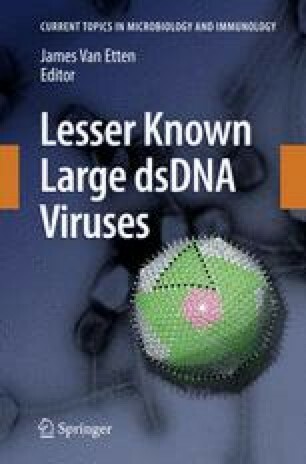 Ascoviruses are members of a recently described new family ( Ascoviridae ) of large double-stranded DNA viruses that attack immature stages of insects belonging to the order Lepidoptera, in which they cause a chronic, fatal disease. Ascoviruses have several unusual characteristics not found among other viruses, the most novel of which are their transmission by endoparasitic wasps and a unique cytopathology that resembles apoptosis. Cell infection induces apoptosis and in some species is associated with synthesis of a virus-encoded executioner caspase and several lipid-metabolizing enzymes. Rather than leading directly to cell death, synthesis of viral proteins results in the rescue of developing apoptotic bodies that are converted into large vesicles in which virions accumulate and continue to assemble. In infected larvae, millions of these virion-containing vesicles begin to disperse from infected tissues 48–72 h after infection into the blood, making it milky white, a major characteristic of the disease. Circulation of virions and vesicles in the blood facilitates mechanical transmission by parasitic wasps. Although ascoviruses appear to be very common, only five species are currently recognized, with the type species being the Spodoptera frugiperda ascovirus 1a. Ascovirus virions are large, enveloped, typically bacilliform or reniform in shape, and, depending on the species, have genomes that range from 119 to 186 kbp. Molecular phylogenetic evidence indicates that ascoviruses evolved from iridoviruses (family Iridoviridae) that attack lepidopteran larvae and are likely the evolutionary source of ichnoviruses (family Polydnaviridae), which assist endoparasitic hymenopterans in overcoming the defense responses of their insect hosts. Thus, as other molecular evidence suggests that iridoviruses evolved from phycodnaviruses (family Phycodnaviridae), an evolutionary pathway is apparent from phycodnaviruses via iridoviruses and ascoviruses to ichnoviruses.